Pohang (포항) is a city in North Gyeongsang (경상북도) in South Korea. Pohang is a major industrial city on South Korea's east coast, about 110km (70mi) North of Busan and about 360km (230mi) SE of Seoul. Pohang is home to POSCO, one of the world's largest steel companies, which sits prominently on the bay. It is well-known for POSTECH, a highly ranked university in the physical sciences, and Jukdo Market, one of the most popular fresh fish markets in Korea. Pohang has a new train station that is served by KTX. It is About 4 km North of city hall, but the path is rather circuitous. A taxi from most places in Pohang will cost about W10,000 The previous station is now an intersection. Trains run from Daegu (1.5 hours), Busan (2-3 hours) and Seoul. Pohang Airport 포항공항 lies about 10km East of the city past Posco. Domestic flights only. To get there, take city bus 200 towards Guryongpo 구룡포. There are two bus stations in Pohang. Shiwae (Intercity) Bus Terminal 시외 버스 터미널 Buses run to nearby cities and almost every major city in South Korea. Gosok (Express) Bus Terminal 고속 버스 터미널 Buses run to Seoul, Gwangju, Daejeon, Masan, and Seonsan Resting place Transit Center. There is no subway system in Pohang. 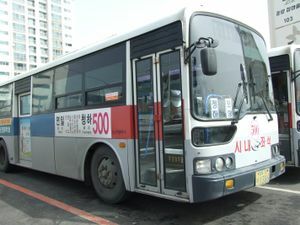 Buses run regularly throughout Pohang and the surrounding areas. 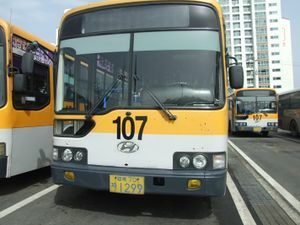 There are two kinds of buses: General Buses(일반버스) and Seat buses(좌석버스). Fare for the General Buses are slightly cheaper than fare for the Seat buses. General Buses is painted blue and orange, and Seat buses is painted Green and Gray. The city bus is operated 31 Line. It can be difficult to figure out which bus to take if you only know your destination. Call 054-1330 for free travel information in English, Japanese, Chinese, and Korean. Taxis are relatively inexpensive as long as you are traveling within Pohang city limits. The base price is 2,200 won (2,400 won after midnight) and increase in 100 won increments based on distance and time. At night POSCO turns the multicolored lights on, and the skyline of red-and-white-striped smokestacks turns all the colors in the fluorescent rainbow. Well beyond POSCO (a very expensive cab ride after the buses stop running) lies a small fishing village called Homigot. The Hand of Harmony at sunrise. This is the easternmost point of the country. To get there, take bus #200 outside of the Intercity Bus Terminal. Transfer buses at 구룡포 (Guryongpo) and head for 호미곶 (Homigot). While the beaches in this town are too rocky to be considered viable for swimming, there is an artistic oddity worth noting; The Hands of Living Mutually or Hands of Harmony. This is a massive bronze sculpture of a hand stretching up from the water in a small cove. A second bronze hand of equal proportion stretches up from dry land on the other side of Homigot Sunrise Square. The less-famous Hand of Harmony illuminated at night. The hand in the water is the attraction, particularly at sunrise. This particular cove's claim to fame is that it is the farthest point east in Korea (also referred to as the Tiger's Tail) so the sun rises here first. This charming place is a bit of an obscure tourist trap. Amateur photographers from all over the country come to shoot pictures of the sun rising through the fingers of the hand. Some bring expensive state-of-the-art equipment whilst many will merely whip out their cellphones and start shooting. This can be a crowded shoving match over the rocks and ocean. Some will even venture waist-deep into the water, hand-phones held high, amidst squawking seagulls, to get a better shot of the bird-soiled sculpture. New Year's Eve is presumably the best time to visit, The Hand as there are fireworks and festivities that run until dawn shortly after 7:30 a.m. Many however, come during the summer months, when temperatures are more agreeable. While there are hotels within an easy walk, some opt to sleep out on the square with a friend, a sleeping bag, some mosquito spray and a couple bottles of soju. The sun rises early in Summer (shortly after 5 a.m. in late-June), especially given Korea's lack of Daylight Saving Time and perhaps inappropriate time zone. Near the sculptures are a lighthouse and museum along with numerous tourist shops, seafood restaurants, peddler tents and the likes. The local-owned tourist shops can be immensely helpful when finding a place to stay or the next bus out. Visitors may be wary of the traditional squat-toilets in the public restrooms nearest The Hands. Western-style plumbing can be found at the restrooms outside the lighthouse museum nearby. There are a few hotels within a ten minute walk toward town, mostly wedged in the network of small roads and alleys west of The Hand. These places start at approximately ₩40,000 per night and checkout can seem obnoxiously early after viewing sunrise and going back to bed. Pension accommodations can be found on the other side of town, past the broadcast stations along the shore. Getting to these will involve a little exploring. Pensions during summer start at about ₩70,000 per night per room. Located in Songdo-dong, Songdo Beach sits directly across a small inlet from POSCO's steel mill. Though not popular for swimming, it often attracts windsurfers. Bus 130 and get off at "Songdo Beach" Stop. Located just north of downtown Pohang and across the bay from POSCO, Bukbu Beach is a popular (i.e. often crowded) summertime hangout. It is more popular than Songdo Beach for swimming, though the brown color and its proximity to POSCO keep many people out of the water. Bus 101, 105, 200, 600(On 15 February 2012 the route was extended.) 700 and get off at "Bukbu Beach" Stop. The International Fireworks Festival  is held here every year in July. About 10km north of the city. Clean water and good waves. Inner tubes are for rent (10,000 won). To get here, take an intercity bus 50 minutes north towards Yeongdeok or Uljin and get off at Chilpo. 4km north of Chilpo Beach, Wolpo Beach is often less crowded. Inner tubes are for rent (10,000 won). To get here, take a bus to Yeongdeok and get off at Cheongha. The beach is located 1.5km from the intersection. In summer, take Bus No. 500 to Wolpo from the express bus terminal (고속버스터미날). The buses run 11 times a day. Guryongpo Beach is about 10km east of the city. Though small, Guryongpo Beach has clear blue water that attracts snorkelers, and fishermen. To get here, take bus 200 from the Intercity Bus Terminal (시외버스터미널) to its final stop at Guryongpo. The beach is 2km north from there. Within Guryongpo Beach itself, food is mostly limited to sashimi, which can be very expensive for small groups. Bringing enough food for lunch or several meals is advised if a 50,000 plate of mixed fish with a plethora of side dishes is too expensive to share. Only one motel can be spotted from the beach proper. Pensions and min-bak accommodations are right next to the sand and run 40,000 and up per night. There are many places to eat in Pohang. You don't have to stumble very far to find a drink in this town, or anywhere in Korea for that matter. If beer is your drink of choice, head for a HOF (호프), which sells cheap Korean beer in pitchers alongside a selection of overpriced anju (안주) - fried chicken, fruit platters, nachos, or dried fish - an order of which is sometimes required. Soju is available anywhere beer is served. Liquor is not always easy to find. It's more popular with expats than Koreans, so heading for a foreigner bar is a safe bet. There are no enforced open-container laws in Korea, so if you're trying to save some cash buy a pitcher from the local Family Mart and head for Bukbu Beach or the nearest park. The main area for nightlife. Several bars in the downtown area cater to the foreign crowd (mix of US military, foreign teachers, university students, and engineers), all with similar atmospheres and identical prices. The downtown area is divided into two main stretches - (1) from the train station to the post office, and (2) from the post office to yukgeori, the 6-way intersection. From the downtown post office, head two blocks east past KB Bank to reach Koreatown. This area of the city thrives on the weekends, when it is packed with a fun-loving Korean crowd, young and old alike. Dance floor, weekend DJs that spin hip-hop and some rock music, two electronic dart boards, and an enclosed wrap-around bar. Beer by the bottle only, Hite 5,000 won. Jack coke 7,000 won. Delicious chicken and fish menu, wooden tables and chairs, and large open windows. 500cc Hite 3,000 won. Korean sake glass 4,000 won. Excellent blended soju cocktails. Expat bar in town. Foreign-owned (Korean-American), bar and restaurant, western menu (sandwiches, nachos, wings, burgers), liquor, big screen TVs. Weekly drink specials. Hite bottle 4,000 won. Jack coke 5,000 won. Behind Valentine Hotel on Bukbu beach. Bus 200, 105, 700, 101 and get off at "Bukbu Beach" Stop. Large projection TV screen, outdoor picnic tables, large group seating. 500cc Hite 3,000 won. Jack coke 7,000 won. Live music on weekends, projection TV screen, outdoor seating. 500cc Hite 3,000 won. Jack coke 7,000 won. 이동온천스포렉스, 469-11 Daejam-dong, Nam-gu, Pohang-si, Gyeongsangbuk-do (Bus 108, 130 to 이동온천스포렉스), ☎ 054-282-8888. checkin: 24 hours. Small size jjimjjilbang compared to ones in Seoul and Busan. The wash and changing rooms are on the second floor and sleeping quarters are on the third floor. 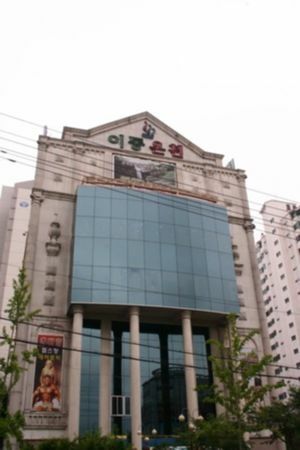 "Jjimjjilbang" is not written in Hangul on the building. Sleeping mats are few in number and are quite thin. There are wooden bricks to use as a pillow. Take bus #130 on the same side as the Intercity Bus Terminal and get off at 이동온천스포렉스. Pay first at the counter on the main floor. You will receive pajamas and a receipt. Show the receipt in the changing room to receive your locker key and towels. ₩7,000. This page was last edited on 22 July 2018, at 06:38.